Ducts function as channels or passages for heating, ventilation, and air conditioning (HVAC) to facilitate air circulation. Airflow is an important aspect to comfortability in a commercial space. The essential parts are supply, return, and exhaust air. Ducts are delivering both ventilation and supply air. Exposing the ductwork or an open ceiling is a trendy feature in modern design. The exposed ductwork is a highly requested design in many today. 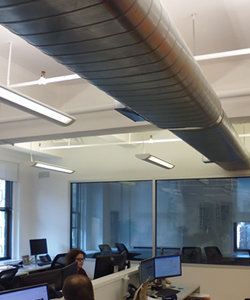 This design of exposed ductwork goes in tandum with the exposed beam ceiling commonly found with commercial lofts. The design adds height to the space and elevates the industrial look to a space. As more tenants request this aesthetic renovations will feature an exposed duct ceiling more often. For those looking for a contemporary design, exposed ductwork is an amazing feature. Due to the high demand, many building managers and owners have noticed the prevalent request for exposed ductwork as an integral of the industrial design. 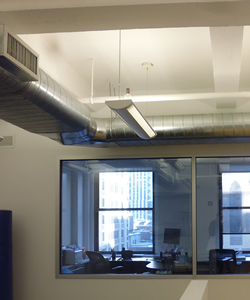 The design of exposing ducts is currently showing up in both new and renovated buildings. Air Terminals: The supply air outlets return air inlets are the main parts of air terminals. The most common supply air outlets are diffusers. Some return air inlets have an air filter (filter returns), but mostly used for appearance. Aluminum: Aluminum is a lightweight material and resists corrosion. The stand out quality is the flexibility and bendability of aluminum. This material is easy and quick to install. Fabric Ducting: Comprised of a polyester material, fabric ducting is used for air distribution and not an air conditioner duct. Many fabric ducts are treated to stop bacterial buildup and prevent moisture. Fabric material can be certified green with materials made of more than 50% recycled materials. Fiberglass Duct Board: Fiberglass is a type of fiber-reinforced plastic. The coating fiber is a glass fiber that is arranged differently. This material is commonly used in many products and a strong lightweight building material. The insulation comes pre-installed. Flexible Ducting: This material is made of adjustable plastic wrapped around metal wire. Typically, this is comprised of glass wool. This material is usually attached to rigid ductwork. Galvanized Steel: The steel is coated with a protective zinc covering. The zinc covering is prevents rusting and is cost-effective. This is a common building material. Plenums: This component is the central units of the system for collection and distribution. The main function is to guide the airflow from the central unit to the rooms. Polyurethane Insulation Panels: This building material is a polyurethane layer placed between structural boards on both sides. The structural boards can be made of plywood, steel, cement board, and even fiber-reinforced plastic. Smoke and Fire Dampers: This component is important for ductwork that crosses fire wall or curtain. This mechanism is in place to detect smoke and close the smoke damper. The fire damper is has an important metal piece that is designed to melt or break at a specific temperature. When the metal breaks or melts it triggers the damper to close containing the fire. Stack Boots and Heads: This ductwork directs air travel vertically within thin walls. The vertical ducts are the stacks and the bottom of the stacks are the boots. Thermal Units: This component is mainly common in multi-zone systems. Different types of thermal units are fan-powered boxes, induction terminal unit, and variable air volume boxes. Turning Vanes: This component guides air through the ductwork changes. This allows air flow to flow easier without turbulence and friction. Vibration Isolators: This component is installed near the air handle to contain vibration and noise. The vibration isolators is made with rubberized canvas material. Volume Control Dampers: This component is used for controlling the airflow volume to the different parts of the system. The volume control dampers may be either manual or automatic. When searching for a commercial space, the heating and cooling are an important feature to consider. To keep the cost of the HVAC system down, it is recommended for duct cleaning, routine inspection, and any repairs. This will maintain the HVAC system at the best level and keep your space comfortable. There are many office spaces available with pre-existing ductwork or a raw office that needs ductwork.